The AltaRica language permits to describe systems in a bottom-up manner. Elementary components can be composed to form complex equipments with their own interfaces and behaviours. The hierarchical nodes are described like the other ones (see the previous section) but they are allowed to declare subnodes and to control interactions of their interfaces i.e. interactions between their flows and between their events. The size of the array must be a constant expression. Flows of nodes can be connected. This concept is formalized by assertions on flow variables of sub-nodes; by default only flows of direct sub-nodes are available. As others invariants, connecting constraints must be satisfied for all configurations of the node and its sub-nodes. The following example describe a compound node called Main that embeds 3 sub-nodes: a generator and two transfer functions. The system is represented graphically below. 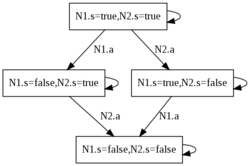 Assertions specified in the node Main enforces the “connection” of flows between nodes. As written above, compound nodes can constrain flows of sub-nodes using any kind of AltaRica expression. Thus, connections are not restricted to simple equalities and even state variables of the compound node. 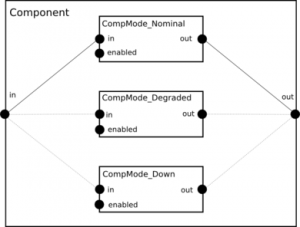 As instance, consider a node Component having three running modes: nominal, degraded and down. Each mode can be described using a sub-component that has the same interface than the compound node. we consider two nodes N1 and N2, that are able to do an action a then the semantics of the system composed of N1 and N2 is depicted below. The interleaving is strict i.e N1.a and N2.a never occur simultaneously. One should note the presence of ε-transitions that model the fact that none of the nodes do an action. It is possible to change the default semantics using synchronization vectors “à la Arnold-Nivat”. Elements of these vectors are events and its semantics enforces all its components to occur at the same time. Subnodes that are not listed in a vector are assumed to be synchronized using the event ε. Several vectors can be specified and an event can occur in several vectors. If a vector is specified then the default semantics for listed events is replaced by the semantics of the vector. Synchronization vectors are introduced using the sync keyword. Vectors are separated by semi-colons; each one starts with < and end with >. Between these delimiters events of the compound node or events of sub-nodes are given separated by commas. The reader should note the non-causality between events involved in a synchronization. The intuitive semantics of < N1.a, N2.a > is that N1.a must occur when N2.a does but, conversely, N2.a must be present when N1.a occurs. If one of the synchronized event is impossible then the whole synchronization can not occur.